Can I ship without paperwork? Yes, you can opt out of having any paperwork. However, if paperwork is required for an international order, it will be included even if you opt out. What's the difference between a packing slip and receipt? A packing slip shows no pricing. This is traditionally used when shipping wholesale type orders. A receipt shows what the customer paid for the merchandise. Who designs the custom paperwork? You are responsible for your design. You can hire a designer or search the internet for templates made by a graphics designer. Can I make revisions to the custom paperwork? Included in the $100 setup fee are 3 small revisions. If you decide to start over or make changes later, you'd be charged the setup fee again. Can I use different types of paperwork for different types of orders? Yes! 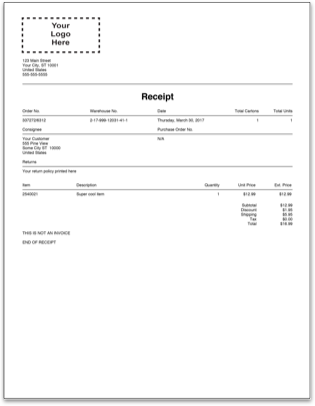 You can have, for example, a 3.25" thermal receipt for your web orders and a 8.5" x 11" packing slip for your wholesale orders. Our customer support team will set this up for you. Can I use pre-printed forms and your system just fill in the information? Yes - you can use pre-printed 8.5" x 11" custom forms. 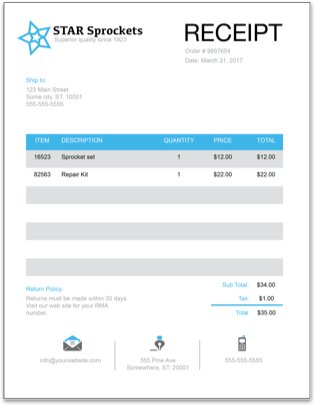 You can also use peel-and-stick forms to include a return label on the receipt. If you have any special requirements, we can typically make it work.